EVS Pro was C Tech's original product for state-of-the art analysis, visualization and animation! 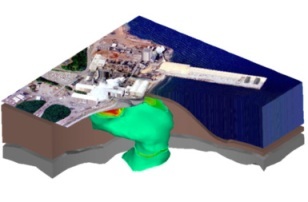 EVS Pro's features included: borehole and sample posting; generation of plumes and ore-bodies, cuts, slices, cross-sections, isolines; ability to visualize and explode geologic layers colored by thickness, material, finite difference and finite element modeling grid generation; 3D fence diagrams; multiple analyte data analysis with advanced gridding, model building, output options, geostatistics capabilities, animation and GIS functions to accommodate litigation support, public relations and the more demanding requirements of earth science professionals. Additional features include high level animation support, real-time terrain fly-over, advanced geologic modeling, interactive fence-diagrams, 4DIM & VRML II output; ODBC Database connectivity, and much more. Mining Visualization System (MVS) was C Tech's flagship product (prior to Earth Volumetric Studio) for state-of-the art analysis and visualization. MVS built upon all of the capabilities of EVS Pro and added powerful features targeted to the needs of mining engineers and planners, or the geologist or environmental engineer with the most demanding requirements. 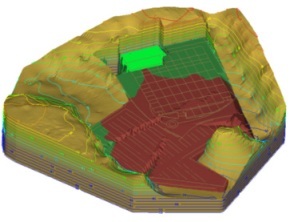 Some of the unique MVS features included: 3D Fault block generation; Tunnel Cutting; Advanced Texture mapping; Mine Pit modeling; Interactive Geologic Hierarchy building; Visualizing and computing Overburden; and many additional advanced features. The licensed standalone 4D Interactive Model Player offered playback of 4DIM models (animations where each frame is an interactive 3D model) in a standalone application licensed with a C Tech Hardware Key. A licensed player was required for 4DIM files created by EVS-Pro, but was not required for files created with Mining Visualization System nor with Earth Volumetric Studio. For that reason, this product is no longer sold.